Outcome of playing with Windows Thin PC and Hyper-V, and the experience has exceeded our expectations. Hardware-wise, our WinTPC system was a year-old Core i3 2.13GHz Sony Vaio with 4GB of RAM and integrated Intel HM55 graphics. A bit over-kill for WinTPC, but fairly inconsequential as most of our testing revolved around RemoteFX. On the server side, we used Windows Server 2008 R2 on a desktop machine with a Core i7 930 at 4GHz CPU, 6GB of RAM, and an Nvidia GTX 460 graphics card. Not exactly server-class hardware, but more than enough for testing a single thin client. 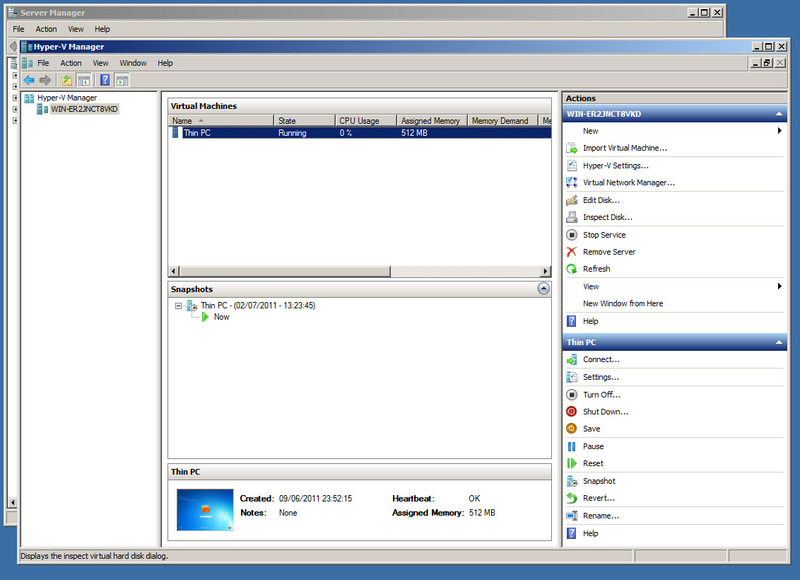 The server ran Hyper-V with a single instance of Windows 7 SP1 with RemoteFX installed. First, it’s important to understand that Windows Thin PC, in its base state, is incredibly plain. Beyond the usual Windows 7 control panels, it has Paint, Calculator, Remote Desktop Connection… and that’s about it. The result is a installation process that’s a lot quicker than Windows 7 Ultimate, and an OS that occupies less than 3GB — some 5GB less than Ultimate. It’s important to note that this is all you get with WinTPC — you can’t customize the installation image. For that, you need Windows Embedded Standard 7, which only comes pre-installed on machines from OEMs. On the flip side, however, WinTPC is free to Microsoft Software Assurance (SA) customers. It’s a stop-gap until the next upgrade cycle comes around, basically. Once WinTPC boots up (which is very quick), all you can really do is open Remote Desktop Connection and connect to a remote computer — which in our case was across a wireless LAN link to Windows 7 SP1 running under Hyper-V. It’s really quite remarkable: you log in, and a few moments later you’re presented with a desktop that looks better than your local thin PC desktop. There’s no dithering on the wallpaper, there are dropshadows under everything, and — this is the cool bit — even Aero works. Transparency! Aero Flip! Aero Snap! There were a few occasions where I actually forgot which system I was on; it really is that good. Leostream goes DaaS, to Offer Windows and Linux Cloud Desktops » « To VDI or Not to VDI?